In the summer of 2012 my friend L and I packed up our laptops and our books and her dog and a four-week supply of nutritional yeast and headed to the lake to write our dissertations. L’s family owns a cabin in the country north of Belleville, “lakeland rockland and hill country.” You travel to it by driving north a ways, and then getting into an old motor boat, riding low in the water with the weight of your food and your books and your dog, and navigating some depths and some shallows until you arrive at the cantilevered dock (a new dock, still a topic of conversation around the lake) and walk your things up the hill to the cabin bag by bag. You have to bring your water in, too, because the lake water’s no good for drinking, though it’s fine for dishes if you boil it first. The cabin has electricity to charge the laptops, enough cell reception for emergencies if you stand at the end of the dock and hold your phone over your head, a hot plate and a barbeque and endless spells of perfect silence. It has everything you need to write a dissertation. This is how our days went: whenever the sun woke us up, we’d head downhill to the lake in a towel for the first swim of the day. Swimsuits weren’t really necessary on weekdays, when the lake was ours. Once we were both up, we’d put on shorts and sports bras, plug an iPod into a mini battery-powered speaker we could bring down to the dock, set up our yoga mats, and prepare for our morning two-person gym class. We took turns leading warm ups, core, legs, arms, pushing each other harder, laughing at the absurdity of our lunges and high kicks on a long dock jutting serenely into the smooth lake, sometimes waving at bewildered boaters or ignoring the questions of curious swimmers. 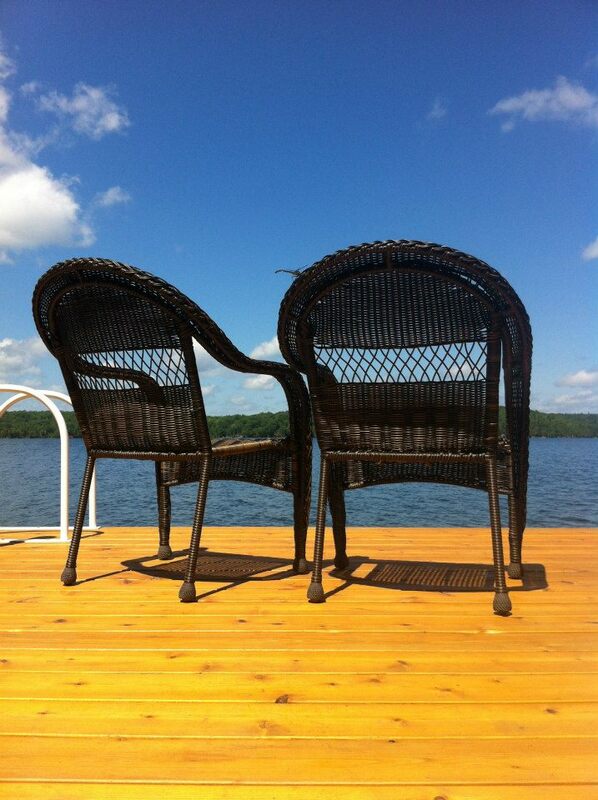 When the workout was over and we’d cooled down with another plunge into the lake, the writing day would begin, on the dock if the weather was fine, in the cabin if it was too blustery. I have never written so happily in my life, there in the woods, when I cured writer’s block not by checking my email but by jumping in the lake for a few minutes, feeling the water on my skin, swimming out far enough that I could float on my back and not see the shore. There, in the woods, in the lake, the solitariness of writing felt not isolating but exactly right. It’s harder, these days, to get to the lake. For one thing, I live in Alberta now, where lakes are few and far between. For another thing, I’m a half country away from L and R, the women with whom I joyfully sweated my way through my PhD. I’m a full-time instructor now, and the days are longer and less my own, and sometimes it feels like doing my job well means doing everything else poorly, my relationships as much as my self-care, however loaded and compromised and commodified a term that is. This is a common refrain: how academia takes us away from our bodies, takes us out of our bodies. But, as hard as this particular moment is, I stand behind the claim that academia—that some parts of academia—gave my body back to me. I have been more or less fat my entire life, and like many high-achieving fat girls, threw myself into schoolwork out of an awareness that this was a venue in which my aberrant, undisciplined body would be, if not accepted, then tacitly ignored. And ignore it I did, through my undergrad and masters, with the exception of a few depressing diets and the occasional stint at solitary, disciplinary gym-going. But the deep dive into academic living that was the PhD brought me two discoveries. First, fat theory, via feminist and queer theory, gave me the conceptual tools to reclaim the pleasures of my fat body. Theory became a foundation upon which I could build both my joy and my furious resistance, something that could ground me back into myself as a body, writing. Second, the isolation and monotony of the dissertation pushed me to build a community of women with whom to enact that pleasure, to make that theory into a sweaty praxis. I miss the lake. I miss the community I left behind. But I get to carry with me the body those years gave back to me. It’s not always going to be a strong or fit body, it’s not always going to be a “well” body, but it will always be my body, so long as I can feel the lake water on my skin. Hannah McGregor makes a Harry Potter podcast called Witch, Please, sings in an all women’s barbershop chorus, and has a cat named Al Purrdy. In her spare time, she’s an instructor in English and Film Studies at the University of Alberta and director of Modern Magazines Project Canada. Her research focuses on Canadian literature and culture with an emphasis on middlebrow literary production, periodical studies, and digital humanities.